Low vision refers to a visual impairment that is not correctable through surgery, prescription drugs, glasses or contacts. It’s often characterized by partial sight, such as blurred vision, blind spots or tunnel vision. Low vision can impact people of any age, but it is primarily associated with adults over the age of 60. Glaucoma is the second leading cause of blindness. Glaucoma causes portions of vision to become lost over time, usually without any warning. For many, a decrease in peripheral vision is one of the first symptoms of glaucoma. Over 20 million people in the United States have cataracts according to Prevent Blindness America. Cataracts appear as the clouding of the lens of the eye. Age-related Macular Degeneration (AMD) is a leading cause of vision loss among Americans aged 60 and older. It accounts for nearly half of all low vision cases. It occurs when the part of the eye that is responsible for straight-on vision – the macula – breaks down and causes loss of central vision. There are two types of AMD, dry and wet. Wet AMD is caused by the growth of abnormal blood vessels under the macula. Central vision loss occurs rapidly with this form of AMD. In dry AMD, light-sensitive cells in the macula slowly break down leading to gradual loss of central vision. Retinitis pigmentosa is a group of inherited diseases that affect the retina resulting in the progressive loss of vision. This type of visual impairment often starts in childhood with poor night vision and progresses over time. According to the National Eye Institute more than 30% of Americans who are diagnosed with diabetes has some form of diabetic retinopathy. Diabetic retinopathy is a major cause of blindness and is directly related to high blood sugar, which damages blood vessels in the eye. This damage affects the retina and can even lead to retinal detachment. There are many other causes of low vision including strokes, traumatic brain injury and other diseases such as Stargardts, albinism and more. 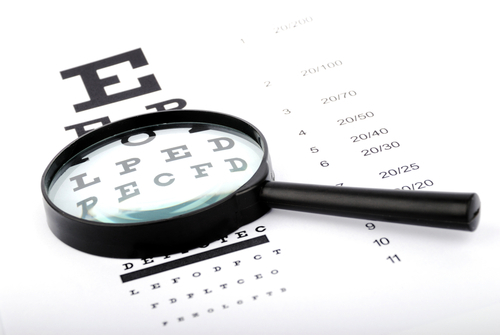 How can low vision be treated? Different cases of low vision require different treatment approaches. Some people develop low vision over time due to aging or a genetic propensity for a certain condition while other people suffer sudden trauma to the eye, which can result in loss of vision or visual impairments. A thorough examination by an eye care professional can help determine the appropriate treatment plan. Catching symptoms of low vision early may help sight to be preserved and in some cases lessen the advancement of vision loss. Though lost vision cannot be restored, a combination of vision rehabilitation and the use of low vision devices can return something that is almost as important — independence and an increased quality of life. The key is working in tandem with your eye doctor. Some low vision devices that can help individuals see more easily include magnifiers, specialty eyewear, mini-telescopes mounted on eyewear, and closed-circuit TV. Treatment plans may also include prescription glasses, specialized optical systems, non-optical options, video magnification, and/or medical rehabilitative therapy to maximize the ability to perform daily activities.